This pad is designed to go over top of the BioMat, making it softer and more comfortable for overnight sleeping. It reduces pressure points and distributes weight over a wider area. Instead of memory foam, it uses a natural, lightweight 3D mesh design, allowing infrared light and negative ions to pass through it easily. The fabric is soft, smooth, and easy to clean. It is made of 3 synergistic layers contributing to a good night’s sleep. - Toca - Tourmaline embedded fabric, designed and made by Richway & Fuji Bio. - Quantum Energy Fabric - Special fabric made of organic substances from peach and grape seeds. Quantum Energy Fabric is made from organic compounds of peach and grape seeds, consisting of more than 18 types of specific substances. The substances are: Phosphoserine, Phosphorylethanolamine, Aspartic Acid, Theanine, Serine, Glutamic Acid, A-aminoadipic Acid, Glycine, Alanine, Citrulline, A-amino-n-butyric Acid, Valine, Methionine, Leucine, Ethanolamine, Ammonia, Lysine, and Histidine. - Bioclay Memory Foam – This foam contains ochre, which has anti-microbial enzymes that do not promote the growth of bacteria. This product will give superior results when used in combination with the BioMat®. The Quantum Energy Pad®, combined with Richway & Fuji Bio's new material processing technology and new comfort system, will bring a new level of restful sleep and healthier living. 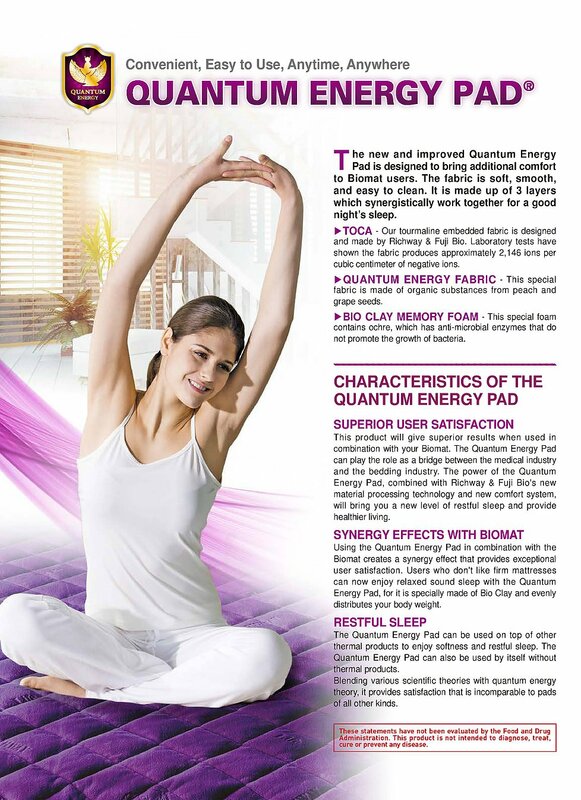 Using the Quantum Energy Pad® in combination with the BioMat creates a synergy effect that provides exceptional user satisfaction. Users who don't like firm mattresses can now enjoy relaxed sound sleep with the Quantum Energy Pad®, for it is specially made of Bio Clay and evenly distributes body weight. The Quantum Energy Pad® can be used on top of other thermal products to enjoy softness and restful sleep. It can also be used by itself without thermal products. 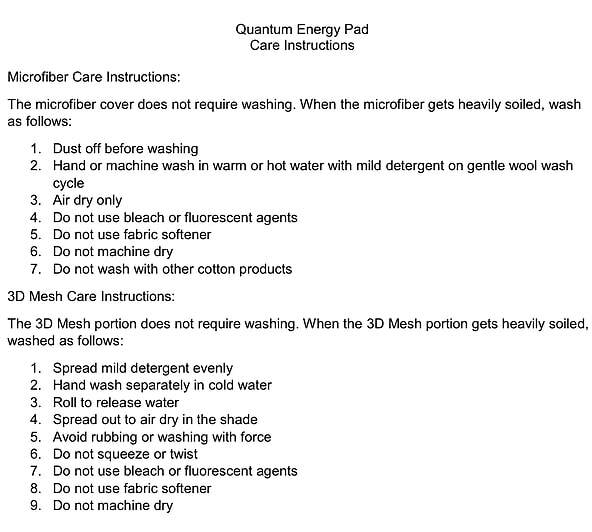 The Quantum Energy Pad® provides satisfaction that is incomparable to pads of other kinds. This product is made of ultra microfiber with a three-dimensional structure, the thickness of which is 1/100th the diameter of a human hair (1 micrometer=1/1,000,000m). There are innumerable spaces in the ultra microfiber formed during the splitting process. Therefore, it yields excellent absorption and easily wipes off dust or contaminants from the surface of an object. The remarkable absorption ability of ultra microfiber lasts permanently because it stems from capillarity activities, a property of the fiber itself, rather than from processing. Microfiber is a new material with excellent characteristics of moisture absorption, cleaning power, soft-to-the-touch texture, etc. It is also a futuristic material that forms layers of air, known for its ability to retain heat better than goose down. - Outstanding Durability - The tissue of microfiber is very fine and dense enough to stand repeated washing and friction without affecting the functionality or shape of the cloth. This allows for incredible durability and long lifespan. In addition, it doesn't require any particular detergent. It is more effective than typical textiles, making it the best alternative to cotton fabrics. - Easy to Wash - Heavily soiled cotton products often have stains even after being washed. This is because the contaminants permeate into the fiber and become permanent. Contaminants cannot permeate into microfiber, but rather stay between air holes on the surface until being rapidly emitted. Just a gentle rubbing with solid detergent can remove contaminants, and it is machine washable. Machine washing doesn't cause deformation of the product. Microfiber products don't need to be rinsed many times, reducing water consumption and saving washing time. - Hygienic - Typical fibers consist of less than 20 strands of thread. However, a visible strand of ultra microfiber obtained from splitting is equivalent to 700 strands of typical fibers. House dust mites, microscopic organisms with sizes of 0.1~0.2mm, are common causes of all kinds of allergies, dermatitis, and asthma, but they cannot inhabit the finely woven microfibers. Survival rate of microscopic organisms on microfiber is only 5.7%. House dust mites are not able to pass through microfiber that is thinner than their bodies. Microfiber is practically a synthetic fiber, so it is extremely unlikely dust mites can feed and flourish on it. Such characteristics make microfiber the most effective material to apply to products that have direct contact with human skin. It is also known as a material that inhibits bacteria, mold, and germs and doesn't give off an odor even when it is damp.